Diabetes Daily. Is My Blood Sugar Normal? 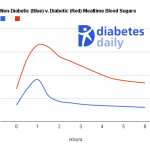 “Is my blood sugar normal?” seems like a simple question–but it’s not! The answer can vary dramatically based on your situation. Let’s look at some of the factors to consider.